Just had a memory blip. Actually this has come to mind several times in the past, but I have forgotten to write about it. Probably because there’s really not all that much I remember. 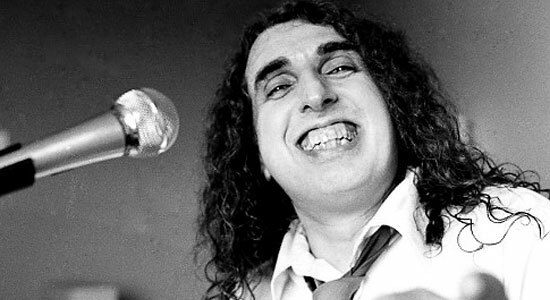 My recollection is that we were asked to play a Holiday Inn (or maybe it was a Ramada Inn) Lounge as the opening act for Tiny Tim. I am pretty sure it was in Clear Lake, Iowa or somewhere near there. According to Ken, he wasn’t with us yet, so it had to be when Mark Zaputil was still our lead guitarist. Kim Ludtke was still with us on drums. Jon, always the promoter, got to get up close and personal with the guy and actually had a conversation with Tiny Tim. I just thought he was sort of creepy. If memory serves, he was white and pasty from all the make-up, and he didn’t shake hands, but did kind of a limp wrist thing. And if anyone thinks his whole persona was an act, I can assure you, he was just the same off stage as he was on stage. I’m not sure if we had any original material by that time, but I believe we did. It had to be around the time we were working on “Handle With Care”. But the music types were such a mismatch, I wonder to this day why they chose us to open for him. I will check with Art and see if he can add anything to this story, but it could have happened in the early days while we were still with Big G Enterprises before Art became out manager.